The gutters protector Gutter Clean system protects your gutters effectively. More than 32 000 000 feets ( 9 750 000 m ) have been installed around the world! The Gutter Clean System may be installed on all gutters, whatever the material used (except PVC) whatever their width. With Gutter Clean System gutter protector, leaves and debris will stay out of your gutters. If leaves land on the eavestrough protection a simple breeze will sweep it away. A wind of 10km/h will blow away wet leaves and about 100 pine needles per linear foot, while a wind from 37 km/h may blow away around an inch (2,5 cm) of pine needles per linear foot. Drains tons of water and protects your investment! 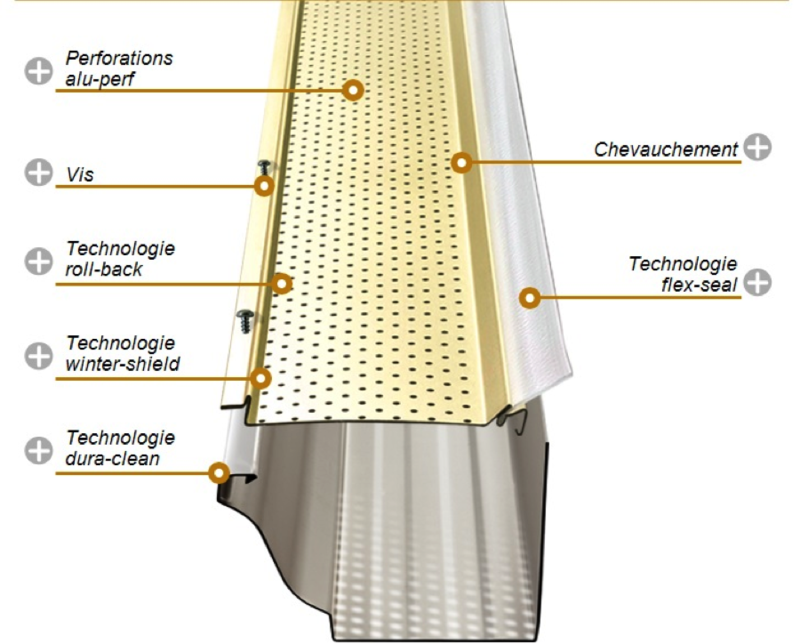 The technology of Alu-Perf technology gutters protector, composed of 312 perforation every 12 inches (30,5)’ allows to drain 29,7 inches (755 mm) of water per linear foot, which is 3 times the amount of water recorded in heaviest rainfalls. An independent test certifies the performance of Gutter Clean System. The cover protector per-sheets Gutter Clean System protects your residence of water infiltrations, landscaping damages, plus several other potential problems.